I recently started a craft project that involves different colors of permanent markers. Of course my children discovered my rainbow stash, and my daughter absconded with the neon pink marker. Surprise! Three hours later I was scrubbing the walls of the playroom, yammering in a stern tone about how “we don’t color on walls, mmkay?”. If you appreciate the muted tones of the semi-gloss in your living room, I suggest you try Memollow Coloring Pages. 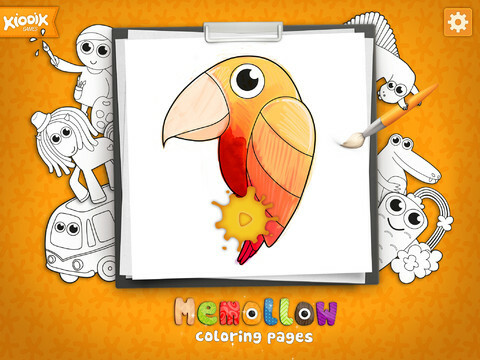 This coloring app from the same people who released the Memollow memory game so it’s perfect for younger players. It includes a group of black-and-white line drawings of everyday objects – things like a smiling cat or a girl wearing a backpack. A button on each page, underneath the name of the item, can be tapped to hear the word out loud. What sets this drawing app apart from some of the others is the variety of different color textures. The paint strokes and pencil lines are realistic and the watercolor function incorporates different tones of one color blended together. When the eraser is used tiny remnants must be brushed away by shaking the iPad gently. There’s even a small picture in the upper left-hand corner that offers a suggestion on how the image should be colorized. As you may have already guessed, my kids love to color – my daughter more so than my 5-year-old son. She liked this app as much as any other that gives players the option of using only pink. When she scrolled through the picture sets and found a unicorn she was disappointed when I told her I wouldn’t be making an in-app purchase (IAP). There are six additional sets that can be bought for $0.99 each or $2.99 for all. I rarely ever make an IAP within a free app simply based on the principle; I expect an app advertised as free to be just that. 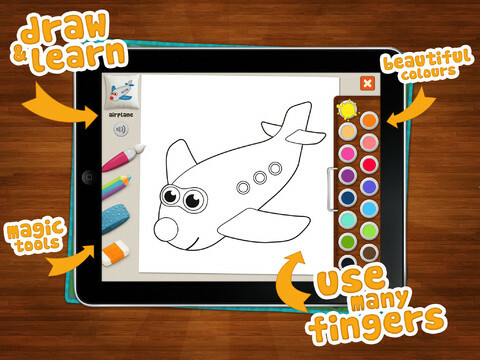 If you have a new iPad user this is a great, free drawing app that won’t overwhelm. 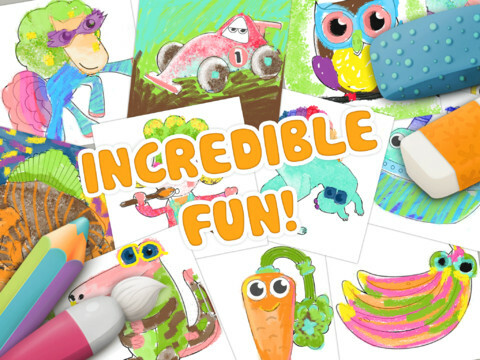 However if your little ones are a little more app-savvy they might be quite underwhelmed by limited free content. Either way the user interface is easy to use and there is quite a bit of visual appeal.